Finding Dory (2016). Read my review for why this Pixar film wasn’t ‘anyfin’ special. 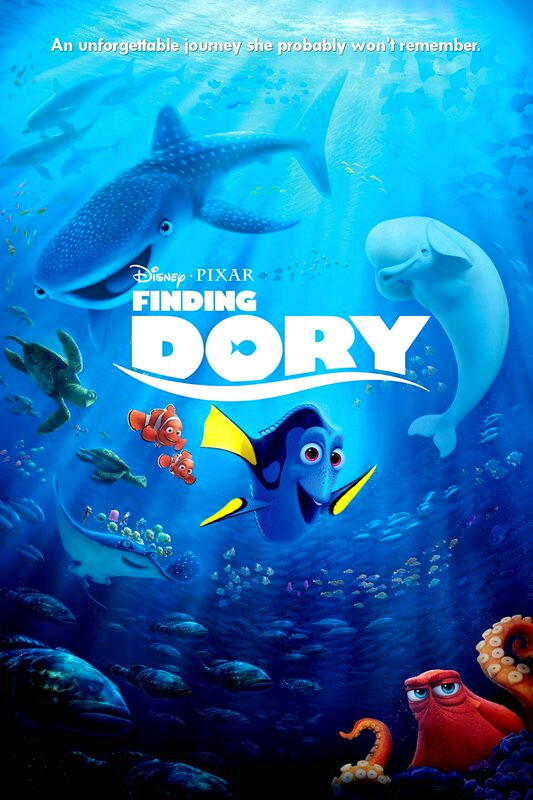 Film review by Jason Day of the Disney/Pixar animated film about a fish called Dory (voiced by Ellen DeGeneres) attempting to find her long lost family, with the help of assorted marine life in this sequel to Finding Nemo. Director: Andrew Stanton. 102mins. Disney/Pixar. (U). Writer: Andrew Stanton, Victoria Strouse. Ellen DeGeneres, Albert Brooks, Diane Keaton, Eugene Levy, Idris Elba, Dominic West, Ty Burrell, Sigourney Weaver. The friendly-but-forgetful blue tang fish Dory (DeGeneres) begins a search for her long-lost parents, and everyone learns a few things about the real meaning of family along the way. Disney and Pixar re-group for their own addition to the ‘Cine-Dementia’ genre that is steadily growing, a Still Alice (2014) for the under-8’s. This is the sequel to 2003’s witty, fun and gorgeous Finding Nemo and it’s hard to pin down why it took them 13 years to produce what is essentially the same film with the character roles reversed. Sure, there were the usual pre-production nightmares (Disney creating an entirely new studio to handle such sequels being one of them. A studio which never made a single film as it transpired), but there are always these things in multi-million dollar Hollywood. Perhaps after 13 years Disney, Pixar and writer/director Stanton (who also helmed Nemo) all hoped that a new generation of children who hadn’t yet seen Nemo would be similarly enthralled by such a unique film. Perhaps they also had their fingers-crossed that the adults out there would have the same short-term memory loss as Dory and not recall the first film, leaving us happily swimming around the goldfish bowl that is the local cinema screen, exclaiming the same delighted ‘wows!’ and ‘whees!’ every 5 minutes. Ellen DeGeneres provides the titular voice in Finding Dory. If I sound like my usual grouchy, can’t-stand-Pixar-films self, forgive me as I have actually been enjoying animated films more of late (I have to – there’s little else to see at my local multiplex!). And there are some good things in here; the politely bullying sea-lions. Hank (O’Neill), the master of disguise Octopus, singularly determined to get himself to Cleveland. 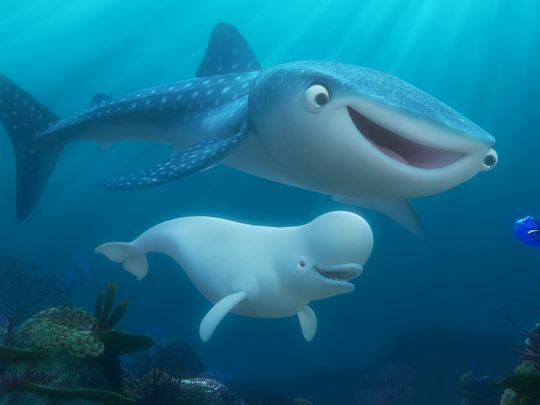 Bailey the Beluga (Burrell) and Whale Shark Destiny (Olson) steal the show with a smart echo-location/water pipe communications system that shows how clever the Pixar team can be when they put their heads together. It’s the only really good idea in the film and, unfortunately, is done to death until it becomes annoying. I adored Finding Nemo pretty much as the rest of the world did but my expectations were not high for this film from the get go, the trailer indicating the sequel would be no more than a re-run with all of the best ideas, situations and jokes either being repeated or left in the archive. Where this ‘sea-quel’ scores is in the richly coloured look of the film and the detail of the animation. Pixar excel here; the ripples of kelp that form the ‘clouds’ of the underwater world, the light dappling down into the water, the full throttle palate of blues and greens. Life under the waves can never be as gorgeous as in the Pixar universe. For me, this just didn’t hit the spot. For the kids? It’s difficult to advise. As I’m not a fan of animated films, when I watch one I find it’s best to also observe the reactions of the children in the audience. For this film, there was a definite muted reaction. Very little ‘wow!’ and precious less of the ‘whee!’ (I’m not counting the other ‘week’, but plenty of those were taken throughout). See the official trailer (scroll down). New films released in the UK on Friday 5 August 2016. Read this list to find out more.